Compared to any other lightweight, bargain drone, the DJI Mavic Air has, up until now, hovered well above its rivals. Its compact frame, robust 4K camera and impeccable obstacle avoidance AI make for a near-flawless choice for drone enthusiasts and newcomers alike. Last week, French drone maker Parrot decided to come for DJI’s throne. The new Parrot Anafi, which ships next month, dazzled us with an equally skinny body, dynamic 4K HDR camera and excellent battery life. If you're trying to decide whether to pre-order promising newcomer Anafi or purchase the tried-and-true Mavic Air, you face a tough choice. We’re refereeing the lightweight championship bout between these two scrappy foldable drones, to see how they shape up in specs like speed, camera, price, AI tricks and more. Plus, keep your eyes out for our full review of the Parrot Anafi later for a more comprehensive look at how it flies. Both the Mavic Air and Anafi sport powerful cameras that sit on maneuverable 3-axis gimbals. While the Mavic Air beats Anafi in a couple of key areas, overall Anafi’s innovative new camera defeats DJI’s camera in design and power. Both drones sport a Sony CMOS camera sensor for photo and video, but the Mavic Air uses a 1/2.3” sensor capable of 12MP (4,056 x 3,040) stills, while Anafi employs a superior 1/2.4” sensor that shoots 21MP (5,344 x 4,016) stills. Comparing lenses, the Anafi has a superior aperture (F2.4 vs F2.8) and can hit faster shutter speeds (1/10000s vs 1/8000s). Plus, Parrot implemented a dynamic new feature in its lens that no other drone, including the Mavic Air, has today: lossless digital zoom. You can magnify up to 2.8x without a reduction in image or video quality, making it easier to film your subject without having to get so close. Still, Mavic Air does just win for camera FOV, at 85-degrees versus 84-degrees. While Anafi wins as the choice for photographers, filmmakers have a trickier choice. Both drones can film in 4K Ultra HD (3,840 x 2,160) at up to 30 FPS, good enough for some impressive home videos. Anafi can even go a step further and film in 4K Cinema mode (4,096 x 2,160), though only up to 24 FPS. Mavic Air can’t do that, but it can film at up to 120 FPS in Full HD or HD. So, while Anafi wins for image quality, Mavic Air could win out for filming fast-moving objects. Mavic Air also arguably exhibits slightly steadier camera support for non-shaky filmmaking. Both have a 3-axis gimbal, but Anafi’s is a hybrid: roll and tilt are mechanically controlled, but the yaw (panning left and right) is digitally controlled, making it potentially less steady. Anafi’s camera does compensate for its less-stable mechanics with an incredible vertical tilt range: it can point straight downwards (-90º) and straight upwards (90º), while Mavic ranges from -90º to only 17º up. Creative drone owners could benefit from Anafi’s ability to easily shoot a full range of up and down. Both drones sport the same max bitrate—100Mbps—but only the Mavic Air comes with any internal storage (8 GB). The Anafi comes with a 16GB microSD card in the box, good enough for about 20 minutes of 4K filming. So, for either drone, you’ll likely want to upgrade your micro storage. We know the Mavic Air supports up to a 128GB card; an Anafi engineer told us that the drone could support 128GB as well, but we don't know if it can go higher. We've asked Parrot for clarification and will update this article when we hear back. If you’re looking for a portable, lightweight drone to stick in your jacket pocket or backpack without feeling the weight, then you really can’t go wrong with either option. Parrot Anafi weighs in at a mere 320g (11.3oz), while the older Mavic Air sits at 430g (15.2oz)—noticeably heavier to carry, but still lighter than most other competitors. Both drones have foldable propeller arms, though with different configurations. With the Mavic Air, you fold the front arms back alongside the drone body, then the back arms fold forward on top of the front arms. With the Anafi, all of the arms flatten outwards, and can be pulled out or pushed in independent of one another. Because of this, the Anafi is much longer, but less wide, than the Mavic Air. Parrot Anafi measures at 9.6 x 2.6 x 2.5 in (244 x 66 x 63.5 mm), while DJI Mavic Air scales at 6.61 x 3.26 x 1.92 inches (168 x 83 x 49 mm). For real-world context, Anafi is shaped like a tall water bottle, while Mavic Air is about the size of a really thick iPhone X. While Mavic Air is easier to carry around, Anafi’s unique design could make up for it for some buyers. Both drones mount their cameras in the front, but Mavic Air’s camera, like most drones, is embedded in the frame to save space. By contrast, the Anafi camera sits by itself, like an insect head. This allows for its 180 degrees of vertical filming mentioned above, since nothing blocks its FOV. Even better, its placement ensures that the rotors never enter your photo or film, while they hover around the edges of your Mavic Air shots. Despite its lighter frame, the Anafi comes built with speed and battery life designed to beat the Mavic Air. But, beyond pure specs, the Mavic Air benefits from DJI AI tech that Parrot arguably hasn’t caught up with yet. In Sport mode, DJI’s drone can hit a top speed of 42.5mph (68km/h), while Parrot’s drone can only hit a max of 33mph (55km/h). Still, keep in mind that Mavic Air only hits 17mph (29km/h) in Normal mode, which you would primarily use for filming and photos. However, Parrot Anafi does beat the Mavic Air in wind resistance. While Anafi can stay hovering in place at up to 31 mph winds (50 km/h), Mavic Air loses stability when winds hit the 19-24mph (29-38km/h) range. Keep in mind that while Anafi can handle bad weather better, neither drone is waterproof, so don’t try testing either drone's muster in the middle of a storm. As for battery life, the Mavic Air’s 2,375mAh battery allows for 21 minutes per flight, though our reviewers discovered 18 minutes to be a closer number for “true flight time”. Parrot claims that the Anafi hits 25 minutes in factory settings, which is closer to what high-end drones like the DJI Mavic Pro are capable of. Once all of our testing is complete, we’ll see how much flight time we get in the real world. If you plan on sending your drone out of visual range, neither drone should cause you any control issues. Both register commands up to 2.5 miles away from your remote controller, via Wi-Fi frequencies at either 2.4 Ghz or 5.8 Ghz, and both can also respond to commands from a dedicated phone app. Once we get into the topic of intelligent flight modes and AI features, Anafi puts up a valiant fight, but Mavic Air looks to clearly be the superior choice. Both drones feature standard flight options like “follow-me” tracking, a return home feature, and smart shot modes where the drone films you while performing dedicated flight paths like boomerangs or dramatic pans upward. Both can film in slow motion, though the Mavic Pro enables this in 2.7K, while Anafi can only hit FHD. Anafi does benefit here from its unique zoomable lens to perform the famous Hollywood dolly zoom, and can even create 3D maps of objects or buildings. Yet Mavic Air has its own exclusive camera gimmicks to compensate for it, including its 32MP sphere panoramas of its surroundings. More importantly, Mavic Air has motion control functionality built in, using its sensors to respond to gestures. You can have it take off, land, capture a still, begin or end filming, fly towards or away from you, or follow you, all through hand gestures. Anafi can’t do any of this. If you put your hand close to it, it won’t even notice. Using its sensors, Mavic Air can also sense and avoid obstacles in three directions—forward, backward and downward. When performing intelligent flight modes like circles, it will automatically dodge around things in its path without manual input. By contrast (as far as we know) the Anafi isn’t capable of any of this sophisticated functionality. You have to be cautious of potential collisions before you begin any automated flight modes. Finally, it's unclear whether the Anafi supports the FPV accessory headset you can purchase for the Parrot Bebop 2. We've asked Parrot for clarification and will update once we hear back. We do know you can purchase FPV DJI Goggles for your Mavic Air for $349 (about £260 / AU$470), while the FPV upgrade pack for Bebop 2 sells for $449 (about £338 / AU$600). 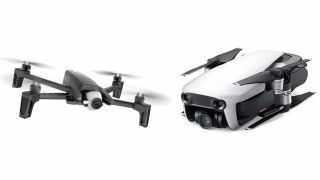 The DJI Mavic Air began shipping out in January of 2018 for $799 (£769 / AU$1,299). For that, you received the drone, three batteries, a remote controller, a travel bag, two pairs of propeller guards, six pairs of propellers, a battery-to-power-bank adapter and battery charging hub. By contrast, the Parrot Anafi, scheduled for distribution on July 1, 2018, is priced at $699 / £649 (about AU$910). Aside from the drone, the kit contains the remote controller, one battery, the carry case, 16GB microSD card, eight spare propeller blades, a USB-A to USB-C charging cable and mounting tool. Anafi’s lower starting price point certainly makes it an appealing option. The lack of propeller guards or charging hub could frustrate some buyers, but at least Parrot’s USB-C cable makes it easy to charge the battery with any portable or home chargers you may already have. More vexing is that Parrot charges $99 for one spare battery and doesn’t include a spare in the box. Without a backup battery, you’ll be stuck waiting for two hours to recharge before getting airborne again. Anafi may beat Mavic Air’s flight time by five minutes, but Air owners can bring their two spares and extend flight time to an hour before having to head home. So, if you decide that a backup battery is necessary, then the price of these two drones becomes pretty much exactly the same. In other words, we recommend you make your choice based primarily on the specs we outlined above. We weren’t being hyperbolic when we said Parrot Anafi is a legitimate contender to challenge DJI Mavic Air’s dominance. Its superior camera and battery, comparable tight design, speed and price, and fun features make it a worthy choice of any first-time drone buyer. We do, however, worry about its ability to keep itself out of trouble. DJI’s obstacle avoidance can’t prevent every potential disaster, but it’s certainly better than nothing at all. If you trust your drone piloting skills to keep it from any crashes, and want to reach the next level of drone photography and filmmaking, then Anafi could be the drone for you. But, for a potentially safer, smarter (in terms of AI) choice, you can’t go wrong with our current favorite.